The Great Lakes Chamber Music Festival occurs every year for two weeks in June, softening the blow of the end of the Detroit Symphony Orchestra's season for music lovers. A few years ago, personal and logistical issues made it impossible for me to cover the season, and so I was pleased to attend opening night in my hometown of Beverly Hills, Michigan. 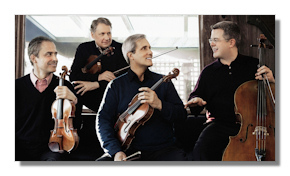 Unfortunately, an all-star lineup of chamber musicians did not an all-star concert make. As I've often written, reviewing is a terribly subjective business, and many patrons went home very happy. I was not entirely satisfied, but there were plenty of good things to appreciate. Franck's chamber music isn't all that well-known, and it's not especially engaging on evidence here. Like his lone symphony, it's somewhat heavy and rather sober. None of this is the fault of the Calidore String Quartet, a talented group of young musicians. James Tocco also remains a fine chamber musician who provided confident and tasteful piano playing. I strongly suspect that changing weather patterns in this region of the state plus questionable acoustics had a negative effect on the string players. Intonation and coordination were both suspect throughout the program, even for the veteran Emerson String Quartet later in the program. So I blame both the space and the elements, because although many in the audience were pleased, the Franck did not get us off on the right foot. Things did not improve markedly with the Chausson, an interesting setting for voice and small ensemble that hardly warrants repeated hearings. It was interesting to see cellist Paul Watkins – who also serves as Artistic Director of the Festival – on piano a la Rostropovich, but Skuce Gross' French diction left something to be desired and the work (if one was following the texts) was rather truncated. Happily, the Octet that formed the second half of the program was very good. The combined quartets played extremely well, though again I found tuning and coordination to be an issue. Whatever my feelings, no one could deny the excellence of these players, and the seasoned mastery of the Emerson paired well with the youthful enthusiasm of the Calidore. Forced to choose between the two groups, the leadership and "lived-in" qualities that the Emerson's foursome brought to the party gave them a slight edge, but only just. If I had a complaint, it's that neither group really captured Mendelssohn's lightness and wit. True, you shouldn't play this music as fluff, but there's a good deal more joy in this music than heard here. This was George Szell's Mendelssohn for chamber players, a razor sharp, highly virtuosic display that was nevertheless short on charm. That said, I insist that a venue possessing more natural warmth would have helped both the musicians and listeners. Despite a rough start, I'm glad I was there.